This issue’s selection includes an Estonian space-saving modular build that would see its space heating demand fall by eight if built in Dublin’s climate; a family home on a tight site that became Seattle’s first passive house; an ultra low energy Italian timber box that acts as a confident, sustainable response to a natural disaster; and a passive community centre in the Austrian Alps that makes stunning use of timber. The community of Saint Gerold occupies a steep southern slope in the Austrian Alps, commanding sweeping views across the valley below and the mountains beyond. The municipality's new passive house community centre, finished in 2009, is home to a preschool, playgroup, shop, function room and local authority offices. The form of the building references the neighbouring schoolhouse, which is a protected structure, and the local church too. Sited at the entrance to the village, the new building acts as a gateway to this remote community. It's also the first four-storey timber building in Vorarlberg, Austria's westernmost state. The centre was constructed from prefabricated timber walls panels, most of it sourced from St Gerold's own forests. All sawmill and joinery work was carried out in the neighbouring village. The building isn't just about energy though, but ecology too: the timber framing is insulated with sheep's wool and wood fibre, materials like PVC and paints with heavy metals were designed out, and even the elevator was constructed with wood. The building's space heating demand is 14 kWh/m2/yr, and any warmth needed is provided by a geothermal heat pump, which also provides cooling in summer. Waste heat dumped by the shop's cold store is also captured for space heating. And with 2,000 metre mountains rising above the valley, the views aren't bad either. Situated in Seattle's Madison Park neighbourhood, Park Passive is the city's first certified passive house. Designed by NK Architects and constructed by Cascade Built earlier this year, the four-bedroom home uses 75-80% less energy than a house built to the state's building code. "Passive house’s focus on performance, human comfort and simplicity aligns well with our approach to design," says Boyd Pickrell of NK Architects. "It supports our mission to create dense urban housing that is responsive to people’s needs and supportive of highly sustainable lifestyles." The tiny site was tricky for the designers of the house, which has meaty 450mm double-stud walls and 600mm of insulation in the roof. Airtightness is provide by the internal OSB board, sealed up with Siga tapes. Triple-glazed Intus windows were imported from Lithuania. The home’s vaulted ceilings connect the main living area to an upstairs play area, while the daylit open staircase showcases wall panelling from a tree salvaged from the site. Salvaged wood was also used for the stairs and a bathroom counter. The rooftop deck offers views of Lake Washington and the Cascade mountain range. “Inefficient buildings are the number one consumer of energy in the world, and the largest contributor to climate change,” says Cascade Built founder Sloan Ritchie. 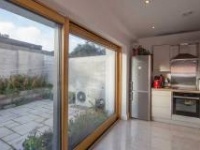 “Passive house design standards offer a way forward towards net-zero building with strategies that are relatively easy to implement – better windows and doors, more insulation, improved air sealing. Passion Smart Design House is a prefabricated modular design by the Passion Group and Estonian firm Architect 11 — and this recently completed 40 square metre version is the first prototype built. Designed to be erected in just a day or two — with most work done off-site — this unit is intended as an addition to an existing house, or as a guesthouse or holiday cottage. The structure is delivered fully furnished, with furniture and appliances "attached" inside. The architects say that by constructing the house in-factory and minimising time on site, they reduce their impact on the local environment. The dwelling is constructed from a glulam frame that's insulated with mineral wool, and solar thermal heating features too. The house was designed with PHPP, though the architects say that some assumptions made by the software — that the house will be occupied year round, for example — do not apply to this prototype unit. 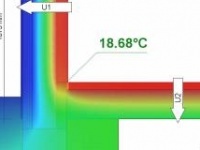 This building's space heating demand is 54 kWh/m2/yr — well outside the passive house standard of 15 kWh/m2/yr. 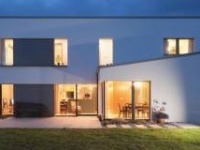 But architect Eero Endjärv switched the climate setting for the house to Dublin, and the space heating demand dropped to just 7kWh/m2/yr — meaning that if this was built in the Irish capital, it would be a passive house. The larch-clad Energy Box in L'Aquila, Italy has replaced a home destroyed during the 2009 earthquake that devastated the region. Architect Pierluigi Bonomo wanted Energy Box to mediate between the past and future, so this new low energy dwelling rests inside remnants of the original house's stone wall: the old stone walls reflect the past, while the new energy efficient, lightweight, earthquakeproof timber structure points to the future. Completed this year, the house was constructed from cross-laminated timber, and the walls are insulated with glasswool insulation internally and woodfibre externally. On the south facade, wide gaps between the larch planks allow for natural lighting and solar gain, while sliding timber screens provide summer ventilation. 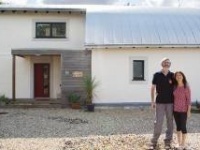 Energy Box was constructed to the Italian Climate House Gold standard, which requires thermal- bridge free construction, a space heating demand of 10kWh/m2/yr, and airtightness of less than 0.5 air changes per hour – levels which, without interrogating the inner workings of the standard, all seem tighter than the passive house requirements. (As an aside, there’s an argument about whether tighter standards than passive house are necessary, given the diminishing returns involved). The house's tiny heating demand (7kWh/m2/yr) is provided by heat recovery ventilation and a few small electric radiators. Energy Box also makes rich use of materials salvaged from the demolition of the old house, such as stone, steel and wood. The house features a solar photovoltaic facade too, and another PV panel on the roof. This means the house classifies as "nearly zero energy," according to Bonomo.